Statistics on student and staff mobility numbers in the last academic year under the former Erasmus programme for higher education. A follow-up to the Erasmus Impact Study - focusing on regional analysis of the benefits of the Erasmus programme. 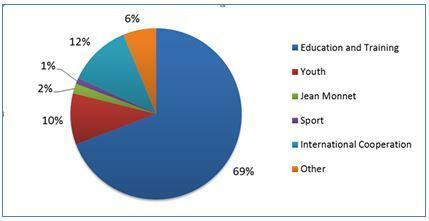 The Erasmus+ programme is the EU's new funding programme for education, training, youth and sport between 2014 and 2020. It combines seven previous programmes into one single, bigger and more coherent programme structure. With a budget of €14.7 billion over 7 years, the programme has seen a 40% increase compared to the previous programming period. In its first year (2014), Erasmus+ has already proved that the programme is living up to expectations. Just over €2 billion were distributed in 2014 to support actions in education and training (69% of the budget), youth (10%) and sport (1%), as well as the other actions covered by the programme. In 2014, the programme already offered about 650.000 individual mobility grants for people to study, train, work or volunteer abroad. These included 400.000 higher education and vocational students' exchanges, 100,000 volunteers and young people undertaking youth work abroad, as well as 150,000 teachers, youth trainers and other staff who gained mobility grants for their professional development. In addition, 11 new Joint Master degrees were set up with non-EU countries within the first year of Erasmus+, to be added to some 180 Joint Master degrees and Joint Doctorates already available previously under Erasmus Mundus. The programme is also continuing to improve the experience of its beneficiaries: more students can now be sure that the qualifications obtained abroad will be recognised in their home countries (85% in 2014, up from 76% in 2013). In order to make the programme more open and inclusive, more than 10,000 students and 50,000 young people with fewer financial means and/ or special requirements have already received additional financial support to participate in mobility actions. Furthermore, to improve the language skills of Erasmus beneficiaries, a new linguistic support tool has also been made available at end of 2014 and benefitted over 120,000 participants in this first year. Erasmus+ also provided funding opportunities for over 1700 cooperation projects across the education, training and youth sectors, addressing key challenges such as early school leaving, the need to equip young generations with digital skills, and promoting tolerance and intercultural dialogue. Encouraging a cross-disciplinary approach, the programme also supported cooperation projects among higher education institutions and enterprises ("knowledge alliances"), vocational study and training institutions with enterprises ("sector skills alliances") and initiatives to strengthen education systems in developing countries ("capacity building projects"). As a novelty, Erasmus+ also introduced funding opportunities for policy support actions to tackle some of the key challenges to Europe's education, training and youth systems in innovative ways. In 2014, several projects were pursued with the involvement of public authorities, international organisations like the Council of Europe and OECD as well as platforms and networks of stakeholders across these sectors to address issues like early school leaving, human rights and citizenship education, youth participation, social inclusion of minorities, as well as improving teaching practices and apprenticeship training. In addition, Erasmus+ also for the first time funded activities in the field of sport, supporting about 50 not-for profit sport events, collaborations between sports bodies and grass-roots organisations as well as the first ever EU Sport Forum. The programme also continued to fund Jean Monnet Actions, with 212 projects supported to improve the excellence of European Studies programmes. As a separate report, the Commission today also published new figures on the last academic year (2013/14)  of the previous Erasmus programme, which covered higher education mobility and cooperation projects under the former Life Long Learning programme (2007-2013), now incorporated into Erasmus+. The findings show that in its last academic year, a record number of people benefitted from an Erasmus grant, with 272,497 students, including more than 60,000 trainees, and 57,488 higher education staff receiving funding for studies, training, job placements and teaching or training abroad. This also represented a 2% increase compared to the previous year. An overview of the increase in Erasmus students since the start of the programme in 1987/88 is available in ANNEX 1. Most countries participating in Erasmus saw increases in the number of Erasmus students going abroad (see ANNEX 2 for more details) in the final year of the programme. Decreases experienced by some countries can however be explained by different reasons, including drops in student population numbers, overall national co-funding budgets or an increase in the average Erasmus grants. In 2013/14, the most popular destination countries for students remained Spain, Germany and France (39,277; 30,964 and 29,621 incoming students respectively). The same countries also sent the most students abroad, with Spain sending 37,235; France 36,759 and Germany 36,257 students. The number of teachers and staff going on educational exchanges grew by 9% compared to the previous year. This includes a growing number of people from companies invited to undertake teaching assignments at higher education institutions abroad, which grew in popularity by 17% on the year before. The top sending countries were Poland (7,178), followed by Turkey (5,838) and Spain (5,727). The top destination for staff mobility was Spain (5,701), followed by Germany (5,101) and Italy (4,860). In addition to mobility grants, the Erasmus programme (2007-13) also supported cooperation projects to modernise European higher education and develop innovative education policy tools. In addition, interest in such cooperation projects grew year-on-year, with 311 applications submitted in 2013 (up from 250 in 2012). Finland submitted the highest share of all proposals (13%), followed by Belgium (12%), Spain (11%) and the UK (10%). Belgium was also the most successful in terms of applications approved with 15 projects accepted – a 19% share of the 79 funded projects in total. The Regional Impact Analysis of the Erasmus programme follows and builds on the Erasmus Impact Study published in 2014, which looked at the impact of Erasmus student mobility on participants' skills, employment prospects and career paths. The new regional study brings an additional regional focus to the same data. While the 2014 study found that Erasmus students are half as likely to experience long-term unemployment compared to those that do not go abroad, the new Regional analysis confirms that students from Eastern Europe are 83% less likely to experience long-term unemployment if they have taken part in Erasmus. Similarly, traineeships and work placements have a positive impact on finding a job – but this seems to be particularly valuable for students from countries in Southern Europe like Italy and Portugal, where half of those training abroad were offered a position by their host company. Overall, Erasmus students are not only more likely to be employed, but also more likely to secure management positions. On average, 64% of Erasmus students, compared to 55% of their non-mobile peers hold such positions within 5-10 years from graduation. This holds even more true for Erasmus students from Central and Eastern Europe, where around 70% of them end up in managerial jobs. LLP, Youth in Action, Erasmus Mundus, Tempus, Alfa, Edulink, Higher education cooperation programmes with industrialised countries. Similar figures for higher education mobility actions under Erasmus+ will become available later this year.